In year-in-review piece in the Chatham Daily News, a reporter talks with the local police about the kinds of calls they got this year. Kijiji came up. Const. Michael Pearce said in a typical year, police average about a dozen calls regarding raccoons. However, in 2010 officers responded to 99 raccoon-related reports. 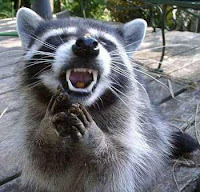 Pearce said some of the callers complained that the raccoons were "staring" at people. In October, The Chatham Daily News reported a possible outbreak of distemper or rabies among the raccoon population in southwestern Ontario. Officials reported that raccoons had been spotted walking around yards and fields in circles, chasing people and coming out in daytime. Pearce said in 2010 police had 184 occurrences involving deer, 75 involving cats/kittens, 23 involving cows, 56 involving horses, seven about skunks, four goats, three ducks, and two each for pigs and snakes. "The loneliest beast was the ostrich, with only a single ostrich-related call in 2010," he said. Pearce said Internet-related reports continue to grow and in 2010 officers investigated 194 occurrences involving Facebook. The number of reported incidents has virtually doubled each year since 2007 with 20 that year, 57 in 2008, 106 in 2009 and 194 this year. "Many of the reports involved threats being posted or harassment," he said. Pearce said in 2010, police took 30 reports involving Kijiji, which were mainly fraud-related. Officers dealt with 283 occurrences that somehow involved text messages.